My only intention was to feed a stray cat. Nothing in life is ever simple though, so why should I expect said feeding of cat to be? That’s right – I shouldn’t. A few days back, I was sitting in the living room, talking with hubby while he was eating lunch. My chair is next to the windows, so as he was talking, I was looking outside. It isn’t that I wasn’t paying attention to him, you understand. It’s that I’ve been cooped up in two rooms for months now, not feeling well enough to spend time sitting on the couch. So now, if I’m not typing or dictating, I’m looking out the window. At any rate, I spied up the street a ways an odd-looking squirrel. It wasn’t until it got a little bit nearer that I realized it wasn’t a squirrel at all, and the reason it looked so odd was because it was a cat! Well, durh. Being a cat person, this orange and white feline grabbed my attention and held it. When she started to play, stalking the squirrels and birds and leaves, I “pursued” her from one window to another through the house, laughing as she made a mad, leaping dash across our yard, disappearing behind hubby’s little shop (which to his consternation I’m constantly calling a shed, which confuses him as we also have a small shed). I love cats, but orange cats in particular are special. To my amazement, after a minute or two, she didn’t reappear around one of the corners but instead, on top of the shed! I presume she climbed the tree that’s in the back corner to get there. Well, that did it. I had to go meet this cat. I swung by the kitchen for some cooked chicken – deli cooked, not cooked here – tossed on my coat, and out the door I went. By the time I got out there, she was down, wandering along the space between the back of the shed and the garden. I spoke softly, calling her to me, and she approached with caution, purrs… and growls. She didn’t get closer than about ten feet, but she was curious. Also, she was a little… off. Not saying she’s a psycho kitty or anything but it’s distinctly possible she’s just that. Which is fine – she isn’t my cat. 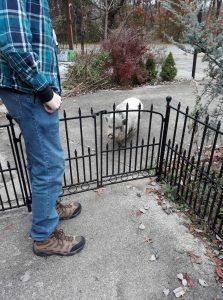 Daisy the Pig, thwarted in her efforts for food and possible scritches by the gate. The flannel-clad long-legged creature is hubby, who was quite amused. People, it was a pig. A spotted, rotund, pot-bellied pig. Where in blue blazes did a pig come from?? We’re not in the middle of nowhere. We’re three minutes from town! Now, to be honest, the first thing that went through my mind was the horror stories you see here and there on the news about wild boars that roam the countryside. The second thing that went through my mind was “you had to come out here without a weapon, didn’t you?” And the third thing? I just had surgery and survived. I don’t want to be mauled by a wild pig! I mean, really! As the cat had made haste in disappearing to safety upon the pig’s arrival, I figured I should do the same. Without shame, I tossed the chicken at the grunting, curious creature as a distraction, and not so slowly made my way back to the safety of the house. I suspected, as she didn’t charge me, that she was a pet who’d gotten loose. I wasn’t up to taking the chance I was wrong about that. I also closed the gate on either side of the patio right outside our front door as I went, since that seemed like a prudent move. Friendly or not, we didn’t need a pig on the porch. By the time I got in the house, my trepidation had turned mostly to amusement. A pig! In the yard!!! Hubby’s exasperation at being disturbed during work quickly turned to amused confusion. The pig, who’d gobbled up the chicken before following the path I’d set, was rooting around outside the patio fence. When he found out I’d been trying to feed the stray cat, he went back in the house and got the rest of the chicken, which he proceeded to distribute across our yard and the yard of the abandoned house next door. The whole time, the pig is following in his footsteps, and I imagine she thought herself in high cotton. I tried to explain that a) the cat was timid/crazy, and b) the pig was hungry and he was wasting his time trying to feed the cat. He didn’t listen. Eh. At least the pig got some food. What to do? That, at least, was easy. Post the pig’s picture and general location on the local Pet Lost and Found board on Facebook. It’s not the first time we’ve had an animal show up here who needed to be ‘found’, so I went ahead and did that. It. Started. A. War. Okay, a war of words, but nonetheless. Some people wanted the pig. Some people knew the pig – apparently, her name is Daisy, and she’s something of a ‘neighborhood’ pig. Others were ready to barbecue. A few people said Animal Control had been called and couldn’t be bothered. Someone suggested feeding her cereal because she likes it. One lady said she was a good pig who’d been left to a gentleman following his brother’s death, and since he didn’t know what to do with her, he put her outside. Still another said she was just a pet allowed to roam free. And then came the fightin’ words. One of the… let’s say more immature members of the conversation, shall we? Well, she literally accused one of the “going to have a barbecue if someone doesn’t do something with that bleeping pig” faction of being crazy, a psycho, not right in the head, scary… and of hurting the pig. She stopped just short of accusing him of being a murderer. I had no idea people would get so upset over a pig. That’s the point where I pretty well backed off from the conversation. The pig was known, other people were looking at coming to get her, and it was none of my business. I had put a call in to Animal Control – trust but verify, you know? But beyond that, I figured I’d just stay out of Dodge and let the people on that end of the street duke it out amongst themselves, as it was. I’d fulfilled my due diligence and stepped into a range war. Excuse me, please… so sorry. In the end, things turned out very nicely for Daisy the Pig. Kevin from Animal Control called me back the next day, was very concerned, and in fact, came out and got Daisy. He was, according to the lady who posted the final update on the thread, taking her to a farm where she’d become a beloved member of a herd of pot-bellied pet pigs. She’ll be as happy there as… wait for it… a pig in slop! Oh, come on. I had to. As for me and my part, I learned a few things. We have some nice, caring neighbors, even though I have no plans to interact with them. More of them are on Facebook than I ever thought, and if I ever need to get up with them, that Lost and Found group is the way to do it. There is way more concern over pigs than I ever expected. There are more missing and loose pigs hereabouts than I ever could have thought. And there are a few neighbors who… well. I’m perfectly content to remain strangers with those folks. Not the “murdering psycho” guy – as it turns out, he was just worried about his kids and his dogs, as the pig was getting aggressive with them. But the pot stirrer? Yeah. She can remain a stranger. Ain’t none of us got time for any of that troublemaking, ya hear?